For this very reason many companies today are moving away from such static systems. They are looking to replace the huge stores of data that older intranet systems oftentimes resemble with solutions that are heavily focused on the employees. What potential do new collaboration systems hold in store? Modern solutions allow companies to deliver targeted internal news to employees while also enabling staff to provide direct feedback and hence establish a line of communication with senior management, for example. 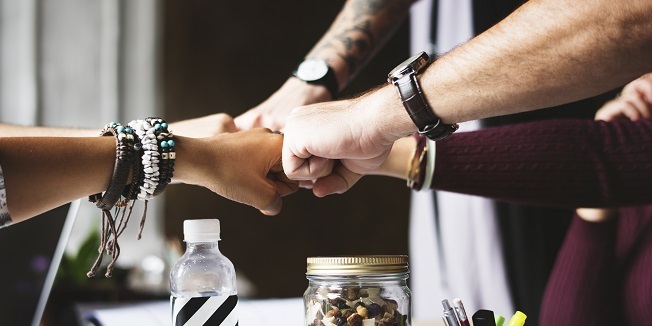 Employees can personally set up collaborative teams, among others, for key projects or for purposes of sharing information on various topics of interest within the system. Each employee has his or her own profile containing information on the person’s main skills, making it possible to locate staff with the requisite expertise. In this way you can create a level of transparency between departments at your company never seen before and provide everyone across the firm with access to internal information. When the collaboration solution is used in this manner, the employee is placed firmly center stage. This means that staff are happier and capable of effectively managing the large number of e-mails they nowadays receive. What’s more, they have a central platform to discuss problems, store files, and help create a corporate culture that spans all departments. fme AG once found itself in the very same situation as the one described above. We wanted to transition away from a static intranet system to a culture of collaboration. In making this transition, our company opted to go with Jive from Jive Software, which covers all key use cases for a modern system. The solution has helped raise internal communication at our company to a whole new level while making day-to-day collaboration much easier. We were so thoroughly satisfied with the product that we’ve joined forces with Jive Software to help other companies make the leap into the unknown and venture into new territory. Is having the ‘right’ collaboration tool all that is needed? Two things are required for a new software to become firmly established at a company: Employees must change how they think and the software has to achieve broad acceptance amongst staff. That’s why it is critically important for departments like marketing, HR, and IT to come together and discuss the various employee use cases. Employee surveys are a useful tool to find out what is really needed and what the former solution lacked. As experience has shown, making the transition to a new system only succeeds if you truly understand the issues faced by your employees. A wise strategy is to start with a lead team comprised of members from different departments. Once the various use cases are implemented on the platform, it will then be possible to gradually open the platform up to more employees. As this happens, an active and vibrant culture can develop over time. Owing to the importance of the issue, we set up a > separate team that will be able to assist you in increasing acceptance for the new software and in understanding what your employees truly want. Where can I find more information on the topic? Visit the > fme Social Business Collaboration landing page to learn more about a modern, new form of collaboration. We would be more than happy to demonstrate how such a system might look in a webinar and discuss with you the best approach to ensure your project’s success. Get in touch with us.